Starbucks Caramel Apple Spice Recipe: A Starbucks Copycat! I love Starbucks Caramel Apple Spice beverage, but it seriously bothers me to pay that much for apple cider. Fancy drinks with flavored syrups and premium espresso? Yes. I can't do that at home. But figure out a Starbucks Caramel Apple Spice recipe so I can make it at home? I can do that! I promise you, you'll be hooked on this Caramel Apple Spice recipe after you make it one time. It's delicious, and it's easy to make Caramel Apple Spice in a crockpot if you're serving it to a group. Even better, you can also make a single serving! I've seen several recipes for Starbucks Caramel Apple Spice that require Starbucks Cinnamon Dolce syrup*. I'm sure you'd eventually use up the entire liter of syrup, but I also think the drink can be made without spending $13-$17 on a gourmet coffee syrup. One more note: get a good caramel sauce in a squeeze bottle for a more authentic experience. It doesn't have to be a $10 caramel coffee topping, though! Look for this Smucker's Caramel Sundae Syrup the next time you're at the grocery store. Serves 1. See below for how to make it for a crowd. Heat the apple juice over medium heat just until boiling. Reduce heat and add brown sugar and cinnamon to taste. (I recommend starting with 1 tablespoon brown sugar and adding more if you want it sweeter) Stir until the brown sugar is dissolved. Remove from heat and pour into a large mug. Top the beverage with a generous amount of whipped cream Drizzle the caramel over the whipped cream. If you want to make Starbucks Caramel Apple Spice for a group, use a slow cooker or a coffee urn (this 30-cup coffee urn is $29.99 and eligible for free shipping) to make the cider all at once. 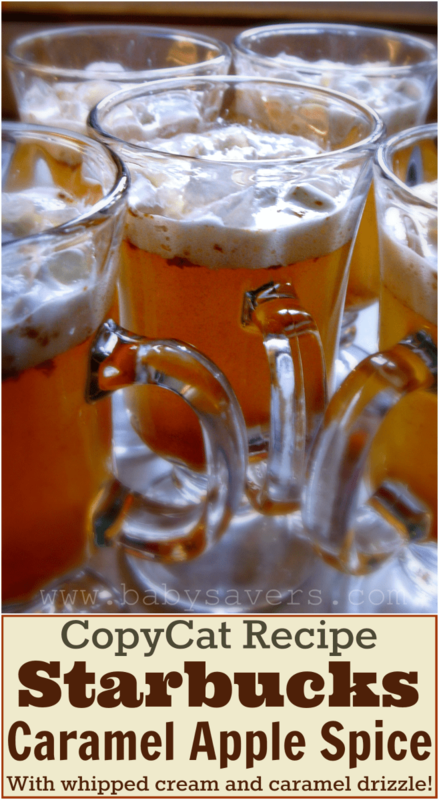 Then allow guests to garnish their cider with the whipped cream and caramel. I'm going to assume your slow cooker has a 4-quart capacity. Two 64 ounce bottles of juice will fill it all the way up, so follow the recipe below that explains how to make it with one bottle of juice. Double or triple the recipe as needed to make as much as you'll need. Pour 1 64-ounce bottle of apple juice into your slow cooker, coffee urn or a large stockpot. Stir in 1/2-1 cup of brown sugar to taste. Add 1/2-1 teaspoon ground cinnamon. Turn the slow cooker on high, turn on the coffee urn or Heat the contents of the stockpot on medium-low. Watch the stockpot so the sugar doesn't burn! When the apple juice mix is steaming, serve in mugs to guests. Top with whipped cream and caramel. *If you do want to use Starbucks Cinnamon Dolce syrup in the single serving Caramel Apple Spice recipe, just omit the brown sugar and cinnamon from the recipe above and use 1-3 tablespoons of Starbucks Cinnamon Dolce Syrup instead. If you're making a batch with a full bottle of juice, use 1/2-1 cup Starbucks Cinnamon Dolce Syrup for each bottle of juice.